The winters in Judea are cold and dark, and on the cusp of the millennium of Christ some 2,000 years ago, the people of the City of David, called Bethlehem, spent most of their time indoors, protected by their warm fires. The livelihood of many of these Judean families was entangled in the wool of sheep, a commodity entirely adverse to the rigors of such a cold winter. Like their masters, the sheep of ancient Bethlehem spent the frigid winter days and nights sheltered, holed up in barricaded caves, called sheepfolds, which the shepherds cut into the limestone slopes surrounding the city. Here the sheep were fed grains and dried grasses until the spring sun warmly invited new blades of grass to rise from the rich soil. Each spring morning, the shepherds would open the gates of the caves, allowing the sheep to spill across the grassy fields. Then, enlivened by the warm spring air, these shepherds would call gaily to one another over the hilltops, even gather together to gossip, to socialize, to trade the secrets of the trade, until the evening temperatures once again chilled. Then the shepherds would raise their staffs and sail their voices over the fields, summoning their flocks to return to the sheepfold. With the cold night air pressing upon them, the flocks would reluctantly return to their caves. This would remain their routine until the blistering eye of summer completely reversed it. Temperatures by day would soar to unbearable heights, and the caves, which had sheltered the flocks against the night chill, would then protect them from the scalding head of the day. But every year there are a few very special and unnamed days which arise between the careless frosts of spring and the ferocious bake of summer. On these days, the temperatures of both the day and the night simmer together with a delicious constancy that allows the flocks to graze throughout the day and long after the sun had set. These days, so good for the sheep, have always been the longest and hardest days of the year for the shepherds. In my mind, I can see such a shepherd on such a day in April, over 2,000 years ago. Look upon him with me as he stands atop a hill. The darkness is wedging its way between him and his flock, so he turns his eyes, wet from fatigue, toward the pinpoints of light which are timidly taking their places in the sky over his head. Soon, they will light his small section of the world. He sighs, knowing full well that his long night is only beginning. I can see his thick hands open and close on his wooden staff as he lifts it behind his head and places it across his shoulders. He swings at the waist, stretching his long torso. The wince which crosses is face testifies that his back already aches, and yet he will not return the sheep to the sheepfold: he will not go home to rest–not yet–for he knows that, although this April day has blossomed into an uncommonly warm night, tomorrow could just as readily bring a deep chill which would keep his flock holed up in the cave all day, unable to graze. No, he reasons as he shifts his weight from one foot to another, it is better to let the sheep feast now, when the hand of God is cupped warmly over the night sky. 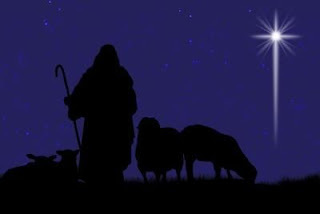 So he, along with his fellow shepherds, remain on the hillside, lingering in the still-warm night, listening to the ordinary bleating of the sheep, and watching as the night sky freckles. These are things that this shepherd has had a lifetime of seeing, of hearing, and of feeling, but his gaze sweeps the heavens, something inside quietly whispers that this is not an ordinary night. 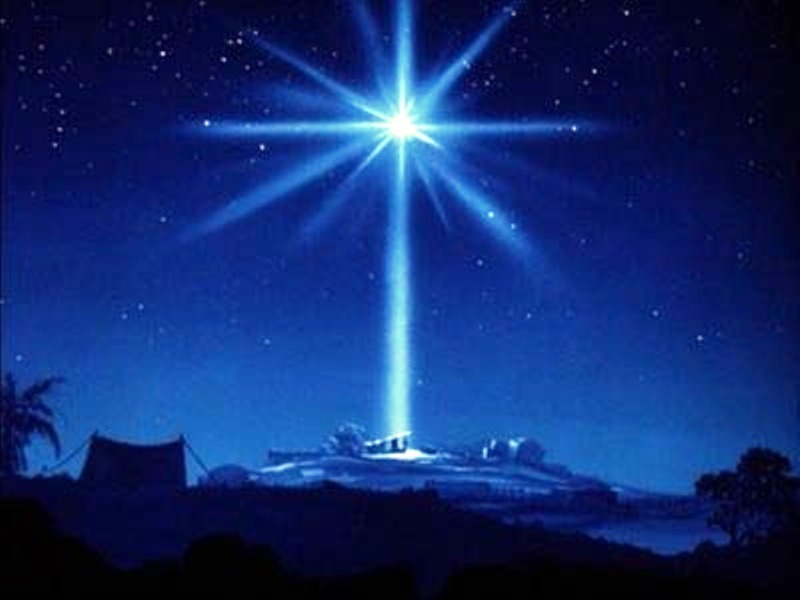 This night, like the new star he sees beginning to glisten brightly over the City of David, is a singular jewel whose brilliance and clarity will never be forgotten. Now, if you will, leave the shepherd on his hill with his flocks and follow me across the eastern border of Israel, into the land of Persia. Let your imagination sweep you through the ornate doors of an eastern palace into the presences of three priests, each well-acquainted with astrology and the traditions of eastern magic. 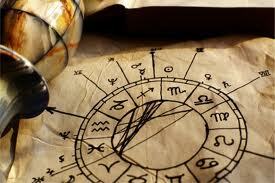 Clothed in their long, gold-trimmed robes, see these priests, or magi, as they lean over a stone table, holding flat several scrolls of an astrological chart which they are combing. In the lamplight, their eyes gleam with excitement when, as one, they determine that the glorious star they see in the west is, indeed, new. Could it be a fulfillment of the ancient Judean prophecy? For you see, the religion of Persia gleaned one thing from the exile of the even-then ancient of Jews: a prophecy promising earthly peace, bestowed by a western king whose birth would be marked by a new star. 9 Lo, the angel of the Lord came upon them, and the glory of the Lord shone round about them: and they were sore afraid. The sheep are stilled. And as the glow of the heavens withdraws itself from round about our shepherd, he gazes through tear-filled eyes upon the faces of his companions–and they gaze at him. Their faces are as soft and motionless as those of porcelain dolls, and reflected in their eyes is that same sparkle of astonishment he feels swirling inside him. His staff slips from his hand as the certainty dawns that what he just saw, what he just heard–an angel and a chorus of Heavenly Host–was real. 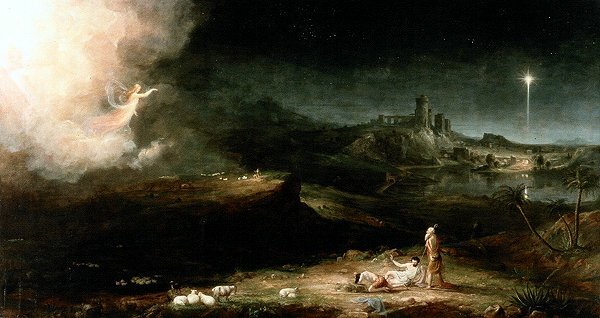 His feet begin move, slowly–but soon he and his friends are all but flying over the gently sloping hills of Judea, running at full speed toward the City of David, toward their God made flesh, toward their Savior. Suddenly, their feet are not so tired and their backs no longer ache. Come with me ahead of them, into the village of Bethlehem. Stand quietly at the doorstep of one common man’s home. Perhaps this isn’t the place you expected me to take you. Perhaps you expected to find yourself at a busy inn, bursting with transients who journeyed to Bethlehem to be counted in King Herod’s census. What am I doing, taking you to the door of a small, village home? Look around you. Notice that you are not standing out in the street, but in a small, narrow shelter attached to the home. There is a staircase in the middle of this shelter that leads from the door of the living quarters, down into the street. It is dark in here and the smells are those of droppings and hay. You are, in fact, standing in a manger, a sort of ancient garage in which homeowners and their guests would tether their horses and donkeys in inclimate weather. According to many Biblical historians, this type of stable, or manger, was a common part of village homes, and, considering many of these scholars prefer the translation “living room” over the translation “inn,” it seems at least as likely that Joseph sought refuge in such a manger as in a sheepfold outside the city or in a hotel stable (Abingdon Bible Commentary 105). Suddenly, you hear from below you, the sharp rise and fall of a woman in travail. Joseph rushes down and envelopes his wife in his arms, sparing her a fall from her mount. She screams again and this scream is so sharp it cuts through the thick wooden door and slices into the conscience of the innkeeper. 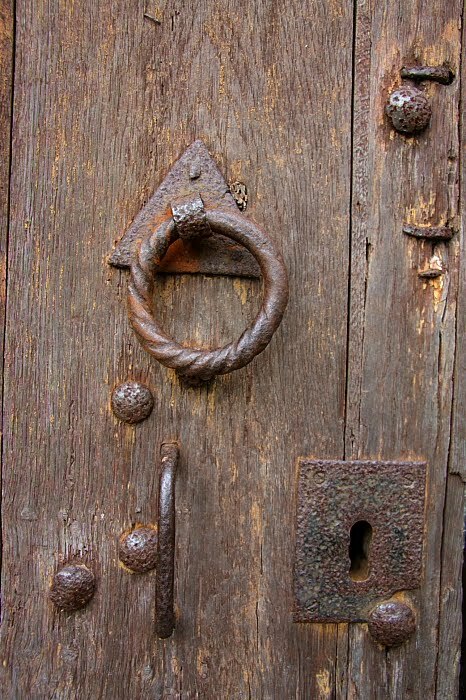 He opens the door, just a crack, and the sounds of gaiety tumble down the steps. He peers out. Mary’s eyes roll up and she looks into the face of the innkeeper. For a moment, Joseph thinks he might be moved with compassion. “Please, any shelter,” he begs. Mary’s breath is coming in short little stabbing gasps and both she and Joseph know that they will go no farther. Likewise, the innkeeper knows and, with a grunt of uncertainty, closes the door on them, leaving them alone in his putrid, dank manger. Mary wants to take his hand, to tell him it is all right, but through her pain she cannot. Back inside his home, the innkeeper returns to his guests, brushing away their questions about the knocks at the door and the scream they had heard. Gaiety–being a difficult thing to abate among friends and family who have long been separated–willing revives itself. That is, until another gripping cry from outside the door silences them all. It is plain what such a cry means. They wait for the baby’s cry. It does not come. All eyes fall upon the innkeeper. Quietly, he walks to the door and peers out. Look with him upon the sight at the bottom of the steps. Young Joseph, his face jubilant and nervous, hands the freshly born son, whose hands and legs shoot out wide from the shock of the air against his skin, to the baby’s mother. 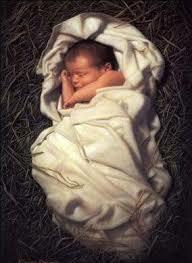 Mary receives him, counting all fingers and toes before quickly wrapping him in a swaddling cloth. Josehp bends over Mary, wiping her brow with a kiss. She smiles (have you ever seen such a smile? ), and her baby boy turns his crinkled face toward her heart and begins to suckle, his translucent fingers desperately kneading at her breast. Such a look of peace fills his small face as, for the first time, he feels the complete divinity of earthly, maternal love. Look upon him. See him. He is born. Christ the Lord, our God, our Redeemer, our Savior is born. There comes a sigh from the innkeeper as he withdraws, quietly closing the door … on Christ the Lord, his God, his Redeemer, his Savior. Although it is dark and well into the night, the appearance of these noble shepherds is not unnoticed. Their presence seems to draw the attention of others and soon an increasing number of people are flocking forward, filling the narrow manger. 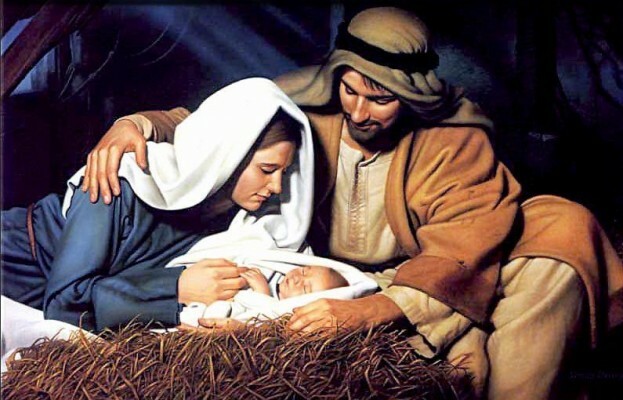 Joseph holds them back, protecting the child and his mother as best he can while Mary, her eyes wide with the wonder of it all, keeps all these things in her heart. The crowd is pushing on us, pushing us hard, harder … pushing us back as it’s individuals angle for a peek at the babe. Do not resist: we have seen what we needed to see. Fall back with me and let the throngs–in their kimonos and ball gowns and business suits, with their chained ankles, powdered wigs, and cellular phones, with their eyes blind and ears deaf–let them whirl through the expanse of space and time; let them find room in the tiny manger. Fade back with me as these others press forward until they too can fill their eyes and their hearts with a love for the newborn King, the Savior of the World. Yes, it is hard to leave, but come. There are others with needs. Come away with me until we are quite without any view at all of the small manger, of the innkeeper’s house, or even the town of Bethlehem. Now we stand alone in the valley of the hills and all that is left of our experience is the sight of the star shining over our heads. Do we really need anything more than the knowledge that the Heavens are filled with the light and the love of God? Turn yourself around and walk on. Let us do as the shepherds and noise it abroad–over the hills, the valleys, the rivers and oceans. Across continents. Many will hear us. For remember: the wise men still seek him. Perhaps we will meet them on their journey, encourage them with caravans, testify that yes, the great, new star that they see in the heaven is, indeed, the sign of the birth of Earth’s greatest King. We have seen Him, the Savior. What more? But should a time ever come when you need another peek at the Holy Child, open that door in your heart because He, like his Father before him, stands there, knocking, begging for a place to stay. Let him in. Let him in. Let him in. Glad it meant something to you, Karyn. Thanks for leaving a note.